Baseball is one of the few sports that can be enjoyed in almost countless versions. Whether it be with broomsticks and racquet balls in a neighborhood street or alley, foam-cushioned indoor balls in a gym or basement, spitballs and your bare hands in any convenient room (or classrooms as many of us got detentions for in our youth), numerous tabletop board games, video games, card games, or variations on a cell phone, there are multiple ways to enjoy America’s favorite pastime. Arguably the most common however, is Wiffleball. The old backyard version of baseball has long been enjoyed among friends and families for decades, but some take it to a much higher, more competitive level. 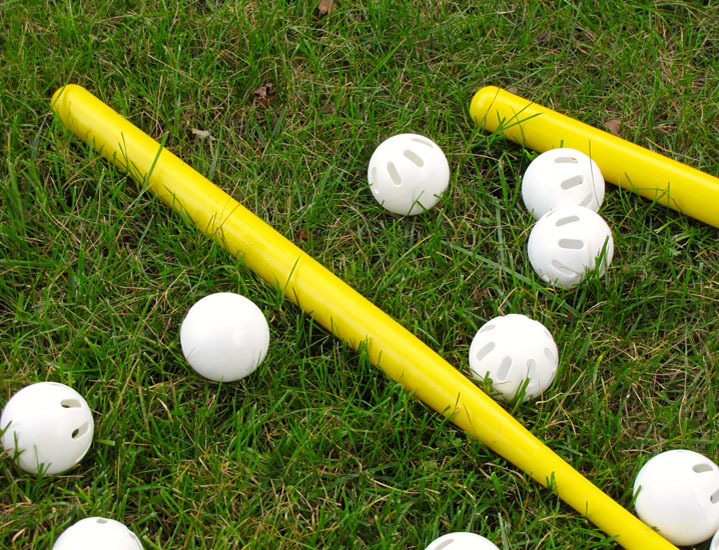 If you do a Google, or YouTube search, you’ll find many Wiffleball leagues nationwide, from officially sponsored leagues to private, backyard club-type organizations among friends. But one man had the foresight to start a trend, at least regionally, which later took off on a grand scale. In this special edition post, we will visit with Illinois resident Chris Walker, a longtime baseball umpire in the Midwest and founder of the former WWL, (Walker Wiffleball League,) which allowed family, friends, and then-current, up-and-coming, and former ballplayers a chance to shine on the diamond in Chris’s custom-built Wiffleball stadium, in a league complete with an official rulebook, compiled individual and season statistics, awards, and well, lots of amazing stories along the way, long before anyone else was doing it. Stay tuned for the full interview and story! Well now this is something you don’t see anymore. And some probably only saw it once, ever. For as bizarre of a game as baseball always is, it was even more strange in the 19th century. Chickens, wolves, and dogs…oh my. On August 22, 1886, in a tied game between the Louisville Colonels and the Cincinnati Reds, the truly unusual happened. Louisville’s William Van Winkle “Jimmy” Wolf, also known as “Chicken”, hit a walk-off, inside-the-park home run to defeat the Reds. This game-winning whack was made possible because a stray dog, uprooted from his siesta near the outfield fence, charged Reds outfielder Abner Powell and started biting his leg. The feral canine attack caused him to be unable to throw the ball in on time as Wolf scored easily. The dog, in essence, saved the Wolf. In the steadily growing list of Things You’ll Never See Again, this scene should be in the top five at least. Also, let us not overlook the irony of a man named Chicken, playing in Kentucky. Baseball, as we know, is a very random game. While strategy plays a crucial role, much is still left to chance and luck. On August 13, 1910 however, no game was played on a more even keel. To this day, no singular game has quite matched the unvaried contest that the Pittsburgh Pirates and Brooklyn Superbas (later the Dodgers), engaged in during the second game of a Saturday doubleheader at Washington Park in Brooklyn. After Pittsburgh took Game 1 by a score of 3-2, the two clubs would enjoy (or loathe?) a seesaw battle in Game 2 that would see both teams end up with identical statistics. In a game full of variables by it’s nature, each team would accumulate 38 at-bats, rap out 13 hits, 12 assists, 2 errors, 5 strikeouts, 3 walks, 1 hit batsman and 1 passed ball. The game ended, appropriately, in an 8-8 tie. A 100% even, identical game. In baseball. What are the odds of that? On this day in 1963, a few rare things happened. First, the Mets won a game. Second, Mets third baseman Jim Hickman would become the first player in franchise history to hit for the cycle. Rarer still, he accomplished the feat in natural order. In a 7-3 win over the St. Louis Cardinals at the Polo Grounds, Hickman was the star. Normally an outfielder but getting a start at the hot corner that day, he would lead off the game with a single, rip a double in the second, a triple in the fourth, and finally cap it off with a home run in the sixth frame. The sparse crowd of 9,977 at the historic old ballpark roared their appreciation for the fantastic accomplishment. Cardinals starter Ernie Broglio would fall to 12-8 with the loss, lasting just 3.2 innings while Mets hurler Tracy Stallard (5-10) would go the distance for the win, striking out four for Casey Stengel’s hapless ballclub. There’s a first time for everything, as the saying goes, but there isn’t a more impressive way to become your franchise’s first player to hit for the cycle than doing it the way Hickman did 53 years ago today.